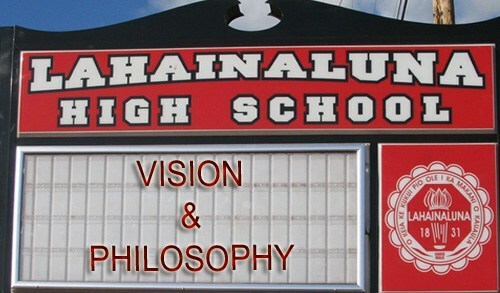 Lahainaluna will strive to provide all students with the knowledge and principles necessary to make them responsible citizens, appreciative of the arts, and aware of the diversity of our global environment. 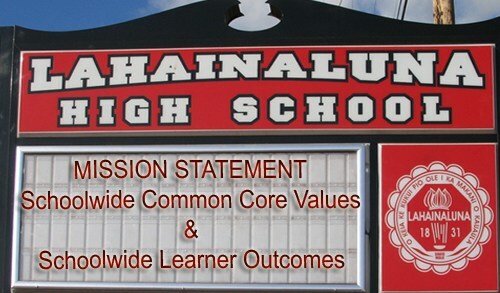 As a school community, we pledge to challenge and to support all students and preserve the heritage that is Lahainaluna. "We are RESPONSIBLE; We are RESPECTFUL; and We Seek Knowledge (DISCOVERY) with INTEGRITY"
Set personal and collective goals and work with others toward their achievements. Manage their time and work. Take responsibility of their own actions and inaction. Intergrate learning and apply it in real life situations. Demonstrate responsibility for self and to others. Show respect for the rights of others. Participate as productive members of the school community and as members of society. Apply problem-solving processes and critical thinking to real life scenarios. Create images to represent significant concepts. Analyze and apply new information. Create intellectual, artistic, practical and physical products. Reflect originality, high standards, and use of advanced technology. Utilize assessment tools in the production of quality products. Utilize spoken and written communication. Incorporate technology as a communication device. Reflect self-expression and artistic appeal. Established career pathway learning communities on campus. These pathways include Arts & Communication; Business Management & Technology (Academy of Hospitality and Tourism); Health & Medical services; Industry, Engineering & Technology; Ninth grade teams; and Natural Resources. Intergrated "Po'okela", a mentor program. Implemented, in school year 2007-08, a Transitions class to allow students to meet the Board of Education's graduation credit requirement for a personal transition plan. Implemented, in school year 2009-10, AVID class. Lahainaluna is a part of a society that is experiencing rapid change. Our school must provide students with the tools to cope that change. Our educational programs strive to be flexible and innovative, while retaining those programs which have proven effective in meeting our students' needs. We recognize the importance of each student. All students can learn, and we must give them the opportunity to maximize their potential. We encourage students to think independently, to have a sense of responsibility for themselves and for society, and to experience the satisfactions and rewards that come from creativity. The ultimate goal of our school is to instill a sense of dignity and self-worth in each student. We strive to develop in each student knowledge and appreciation of democratic principles. Everyone deserves equal opportunity, and we seek to protect students' rights. We believe in excellence and equity in education. We believe students can learn in different ways and should be provided with a variety of instructional approaches to support their learning. We believe that the commitment to continuous improvement is imperative, to enable students to become confident, self directed lifelong learners. We believe standards with clear goals and high expectations for student achievement should guide curriculum strategies. We believe education is a system made up of all components of our community interacting as one.